Today is the first day of Advent, the start of preparation for Christmas. After years of frustration with the materialism that overwhelms this season I never imagined that a book about the Liturgical Year written by a Benedictine nun would be the place where I found release and hope. 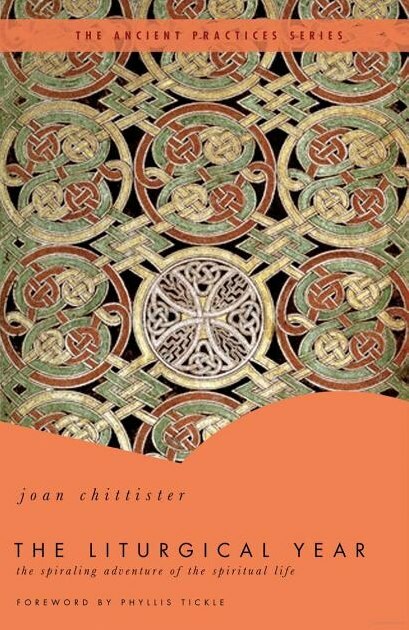 Sister Joan Chittister published The Liturgical Year in 2009 as part of a series of books on Ancient Practices. The books respond to the hunger in every human heart for connection to God. Joan Chittister has lived and taught spiritual practices as an internationally acclaimed speaker for over 30 years. Her writing flows like warm oil on my soul. She knows and understands the deepest longings of the heart and she has wrestled with the complexity of living a life of faith in a cruel world. Reading her words is like sitting at the feet of a wise mentor. The liturgical year is the christian church calendar that begins at Advent and rolls through the following November. It walks us through the life, death and resurrection of Jesus Christ. But rather than it being a catalogue of days, Sister Chittister speaks of it as a framework for spiritual growth. The liturgical year is an adventure in bringing the Christian life to fullness, the heart to alert, the soul to focus. It does not concern itself with the questions of how to make a living. It concern itself with the questions of how to make a life. “How to make a life” – now that sounds practical and relevant. We live our lives in a cycle of years with each bringing us something new and significant. The year I was born. The year my father died. The year I got married. Each year is unique. It marks our lives like the rings of a tree and tells the story of who we are becoming. Jesus walked the earth through many years. As we follow his life through the liturgical year he leads us deeper into the mysteries of the Kingdom of God. Today we can go back to the beginning to re-enter the Jesus story. We can learn more of what his birth, death and resurrection mean for us. We can gain wisdom to name and claim our days. Follow Jesus all the way to the heart of God? Let’s think, pray and live our way into the adventure.